We’d love your help. 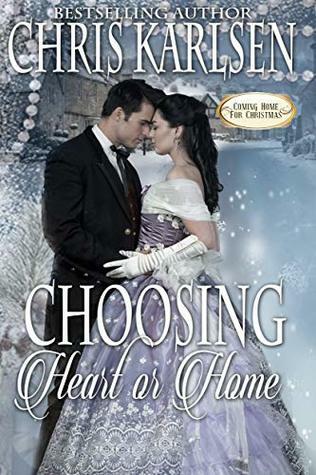 Let us know what’s wrong with this preview of Choosing Heart or Home by Chris Karlsen. To ask other readers questions about Choosing Heart or Home, please sign up. What a moving story that takes place in Victorian England, December 1889. Highly decorated military veteran, Rudyard Bloodstone is now a lead Detective at Holborn Station. He hasn’t been home to Wales in five years and has been asking his lady love, actress Honeysuckle Flowers to accompany him. Honeysuckle’s life has always been around theaters with various troupes. She has the voice and looks of an angel and draws crowds with her talents. The plot will have Ruddy to finally convince Honeysuckle to travel with him from London to Wales for Christmas. She is very hesitant and makes a couple of concessions before agreeing to go. He assures her that his family will welcome her with open arms and not be judgmental of her career. But life is full of surprises, and his mother disappoints him, and once again, Honeysuckle is treated poorly with name calling by Ruddy’s mother, causing them to leave upset. The story will have Ruddy and Honeysuckle spending a day looking around town, lighting a candle in the church, and once again encountering Mrs. Bloodstone and her friend, Mrs. Lyons. Learning of the plight of Mrs. Lyons son killed in battle, wanting a stone plaque to honor the memory of the deceased, and the cost not being something they can afford will have Honeysuckle pondering a way to make it happen. The story will show great character and fortitude by a group of people, who sometimes other look down upon, taking up a cause and making a difference. Not asking for anything for themselves, they show the true meaning of Christmas, giving, and sweet spirit. What is more important, having a relationship with your family, even if you don’t necessarily approve of everything, or missing out of happiness? Two very strong protagonists, very sure of themselves and their roles in the world. I liked them very much. This takes place shortly before Christmas, 1889 . Detective Rudyard Bloodstone is from a large family. His career has kept him from home for several years. This year is special. He has a woman he wants his family to meet. Honeysuckle Flowers, as you may guess, is a stage name. Honeysuckle is not only a performer but a star. In London, she is used to people admiring her status. She is also aw Two very strong protagonists, very sure of themselves and their roles in the world. I liked them very much. This takes place shortly before Christmas, 1889 . Honeysuckle Flowers, as you may guess, is a stage name. Honeysuckle is not only a performer but a star. In London, she is used to people admiring her status. She is also aware that away from a big city, her profession is viewed as less reputable. She loves Rudyard but isn't sure if she should move their relationship forward, as she doesn't want to hurt his career. She is quite happy as things are. Rudyard knows how to influence and manipulate the men under his command. Swaying a woman's opinion may not be as simple. Rudyard assures her that his mother is not close minded and won't disapprove. Well, as most mothers are, she at first thinks no one is good enough for her son, especially someone from the stage. So after getting Honeysuckle to his family home, it seems they are turning around and leaving as soon as they arrive. A chance encounter before the disappointed couple leaves Wales is the turning point of this story and of the attitudes of the local residents. This is indeed the heart of the story. Sweet, clean, with sentimentality, this wonderful romance is a beautiful picture of the times. It also shows the strength of character, both in those giving of their time and talent, and those whose hearts allow them to change their minds. This was an enjoyable holiday escape read. Heroines in romance novels are rarely the type of women I’d like to befriend. They are pouty or reactive or absurdly stubborn or hair-trigger tempered. They deny their feelings and know extraordinarily little about themselves. Honeysuckle Flowers, the female half of the starring lovers in Choosing Heart or Home by Chris Karlsen, is an exception. Strong, loyal, and crystal clear about who she is and what she stands for, unwilling to compromise her principles yet ever flexible to honor her beloved Heroines in romance novels are rarely the type of women I’d like to befriend. They are pouty or reactive or absurdly stubborn or hair-trigger tempered. They deny their feelings and know extraordinarily little about themselves. Honeysuckle Flowers, the female half of the starring lovers in Choosing Heart or Home by Chris Karlsen, is an exception. Strong, loyal, and crystal clear about who she is and what she stands for, unwilling to compromise her principles yet ever flexible to honor her beloved Detective Rudyard Bloodstone, Honeysuckle is bff material through and through. Reading how she navigates the challenges of loving her man while facing scorn from his family, is a touching reminder of how elegance and love can blend for everyday acts of heroism that make for satisfying reading. Rudy is no slouch either. This is a man of honor who seeks to unite his family and lover, and whose optimism and respect for Honeysuckle is steadfast. Even as he quietly fights the demons of post-traumatic stress from his military years, he maintains a high moral and romantic caliber, while showing impressive esteem for his family to boot. It is always refreshing to read about good people facing real conflicts and betting on love. While the brevity of this novella leaves little room for deeper story and character development, the book does a lovely job with what it has. I walk away with a smile, glad these people let love be their guide, and fully expecting that next Christmas will be their best one yet. Detective Rudyard "Ruddy" Bloodstone is ready for the holiday season and he wants to spend it with his new lady love, actress Honeysuckle Flowers. But at this time actresses are generally not well received and considered a lower class than many but Ruddy swears his parents are different. Will Ruddy's family accept Honeysuckle with open arms or will he have to choose between his heart and his home? This was a good story and I really enjoyed it. I always laugh when a character says that their parents Detective Rudyard "Ruddy" Bloodstone is ready for the holiday season and he wants to spend it with his new lady love, actress Honeysuckle Flowers. But at this time actresses are generally not well received and considered a lower class than many but Ruddy swears his parents are different. I always laugh when a character says that their parents or whomever will be different as you know it isn't going to turn out that way. It was super interesting to see the turn in his family and how they viewed Ruddy's own career. I really liked Honeysuckle although I must admit that I preferred her real name and could understand why people would wonder with a stage name like that. That being said she was such an awesome character with a big heart who was ready to forgive things she shouldn't have had to. I loved her gesture towards the end to Mrs.Lyons to honor the dead! I was asked by the authors friend Sharon Kleve to review this book. takes place in December 1898 towards the end of Victoria's reign. London music hall star, Honeysuckle Flowers is to be taken to Wales to meet his parents. At that time music hall stars were not seen as good and proper to the Victorian high society so there is concern for Honeysuckle that his parents will shun her. Honeysuckle comes to the rescue when she discovers his mother needs money for a plaque in memory of soldiers who have d I was asked by the authors friend Sharon Kleve to review this book. Honeysuckle comes to the rescue when she discovers his mother needs money for a plaque in memory of soldiers who have died in battle from their village, what better than to put on a musical show to raise the money. Will this gain the memorial plaque, will his parents see her in a different light and accept- readers you will have to read this and find out. Beautiful, well written and gives the true meaning of Christmas. From the moment her beloved told her he'd like to take her home for the holidays, Honeysuckle Flowers has dreaded the thought of doing so. Despite the fact that she'd rather remain where she is, she concedes and follows Rudyard to his family's home. Rudyard's loyalty is soon tested when his family learns of her profession. Unashamed of being London's most celebrated star, she's determined in showing everyone that she's more than what they think she is. The author has written such a delightful sto From the moment her beloved told her he'd like to take her home for the holidays, Honeysuckle Flowers has dreaded the thought of doing so. Despite the fact that she'd rather remain where she is, she concedes and follows Rudyard to his family's home. Rudyard's loyalty is soon tested when his family learns of her profession. Unashamed of being London's most celebrated star, she's determined in showing everyone that she's more than what they think she is. The author has written such a delightful story. Keeping to the times, you can imagine the situations and the locations the characters find themselves in. Back then, a singer's profession was often thought of as taboo. High society looked down on it at every turn. Honeysuckle is a singer and dancer at the music hall in London and Ruddy is her beau who is a detective. Ruddy wants to take Honeysuckle to Wales for Christmas to meet his parents but she is not sure if she should go because she is afraid his parents will not like her because of her profession and she was correct his mother didn’t like her. When Honeysuckle finds out his mother needs money for a plaque in memory of the fallen military men from their village she decides to help but putting on a m Honeysuckle is a singer and dancer at the music hall in London and Ruddy is her beau who is a detective. Ruddy wants to take Honeysuckle to Wales for Christmas to meet his parents but she is not sure if she should go because she is afraid his parents will not like her because of her profession and she was correct his mother didn’t like her. When Honeysuckle finds out his mother needs money for a plaque in memory of the fallen military men from their village she decides to help but putting on a musical show. Will Ruddys mother change her mind about Honeysuckle after she tries to help out her cause? Ruddy and honeysuckle.are getting ready for a trip to see his parents but she's nervous because she is a movie star and back in the day they were consider harlots and she was right because they leave. Then honeysuckle decides to do a benefit show for a plaque for the fallen soldiers like Ruddy and that brings his parents and when she raises all the money, Ruddys parents invite her and her family for Christmas dinner and they become friends. I received a free copy of this book via Booksprout and a Ruddy and honeysuckle.are getting ready for a trip to see his parents but she's nervous because she is a movie star and back in the day they were consider harlots and she was right because they leave. Then honeysuckle decides to do a benefit show for a plaque for the fallen soldiers like Ruddy and that brings his parents and when she raises all the money, Ruddys parents invite her and her family for Christmas dinner and they become friends. London’s celebrated music hall star, Honeysuckle Flowers and Detective Rudyard Bloodstone’s Holiday plans do not go off smoothly, his mother does not like what Honeysuckle does for a living. Honeysuckle does show his mother how to be able to accept all people by what she puts into place. I enjoyed reading this story, this Author has a way of drawing you into the story. I received a free copy of this book via Booksprout and am voluntarily leaving a review. Ruddy is taking Honeysuckle home for the holidays. Will the family accept her? This is Christmas story showing what the true meaning of Christmas is. There are some moments you want to hit a character over the head and others when what they do will bring a tear to your eye. This is a beautiful book a must read for this holiday season I can tell you if you miss this story you are missing a breathtaking and moving story. I did receive a free copy of this book and voluntarily chose to review it. The setting is Christmastime during the Victorian era.This is a story centered on prejudice, and how the young woman Honeysuckle overcame it. Her supportive beau a detective Rudyard is missing family and begs Honeysuckle to join him on a visit to see his family, it is here she encounters prejudice from his mother. It is a sweet story of love and forgiveness and a nice read. Delightfully different!! An actress and detective in love. She's afraid of what his family will think of her and her profession when he takes her home for the holidays. Will her and her family's generosity win them over? I really enjoyed Choosing Heart or Home. This was a wonderful story and great characters. This a quick read. A well crafted and beautifully plotted am sure I enjoyed reading every beautiful moment and second as it unfolds with issues to sort through the this story. The good storyline and wonderful characters made this book a real joy to read! I was so enthralled with this story that I ended up reading it in one sitting! An intriguing sweet historical holiday romance story, it is heartwarming. Delightful characters. A well-written book. It was a pleasure to read this book. Chris was born and raised in Chicago. Her father was a history professor and her mother was, and is, a voracious reader. She grew up with a love of history and books. Her parents also love traveling, a passion they passed onto her. She wanted to see the places she read about, see the land and monuments from the time periods that fascinated her. She’s had the good fortune to travel extensively thro Chris was born and raised in Chicago. Her father was a history professor and her mother was, and is, a voracious reader. She grew up with a love of history and books. Her parents also love traveling, a passion they passed onto her. She wanted to see the places she read about, see the land and monuments from the time periods that fascinated her. She’s had the good fortune to travel extensively throughout Europe, the Near East, and North Africa. She is also a retired police detective who spent twenty-five years in law enforcement with two different agencies. Her desire to write came in her early teens. After she retired, she decided to pursue that dream. She writes two different series. Her paranormal romance series is called, Knights in Time. Her romantic thriller series is, Dangerous Waters. She currently live in the Pacific Northwest with her husband, four rescue dogs and a rescue horse.